← EXPOSED! – Gilbert Goh Admits To Swindling `Stupid’ Singaporeans Of Their Money! PUTRAJAYA: Malaysian Prime Minister Najib Razak announced a budget review just three months into the fiscal year during which he cut the existing budget by US$1.5 billion. He also reduced the estimated growth rate to 4.5 – 5.5% from 6%. The target for reducing the fiscal deficit was also tempered to 3.2 percent of GDP, from an earlier 3.0 percent target stated in a 2015 budget tabled three months ago. Although PM Najib assures that the country `is not in crisis’, many analysts believe that unless the price of oil recovers soon, the country will be in dire straits due to the lack of savings to fall back to. 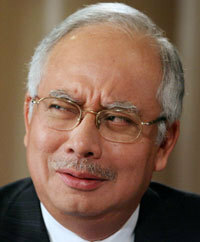 PM Najib famously introduced a slew of handouts worth billions of ringgits to Malaysians particularly to the `bumiputeras’ prior to the recent general elections in a bid to `sweeten’ the ground. During the last financial crisis, the then Pm Mahathir Mohamed was rumoured to have asked for financial assistance from Singapore which was turned down. PM Najib has yet to make similar request.